And I kept driving. But…that bus was haunting me. 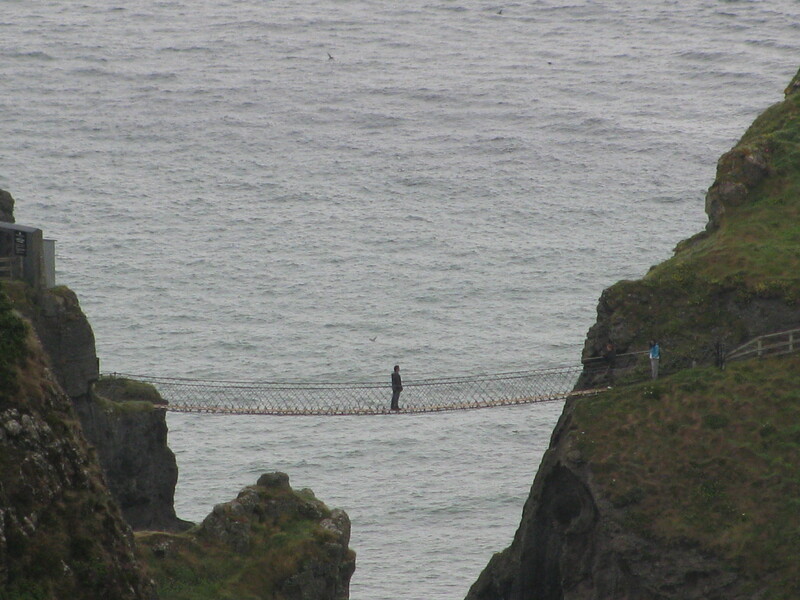 In my family we call it a “missed opportunity,” like when we were in Ireland this summer and DIDN’T walk across the Carrick-a-rede rope bridge, even though we were there. Major missed opportunity. I mentioned this to my father, as we were driving. The whole missed opportunity thing. By now several miles had passed between us and the bus. I told him I was turning around. 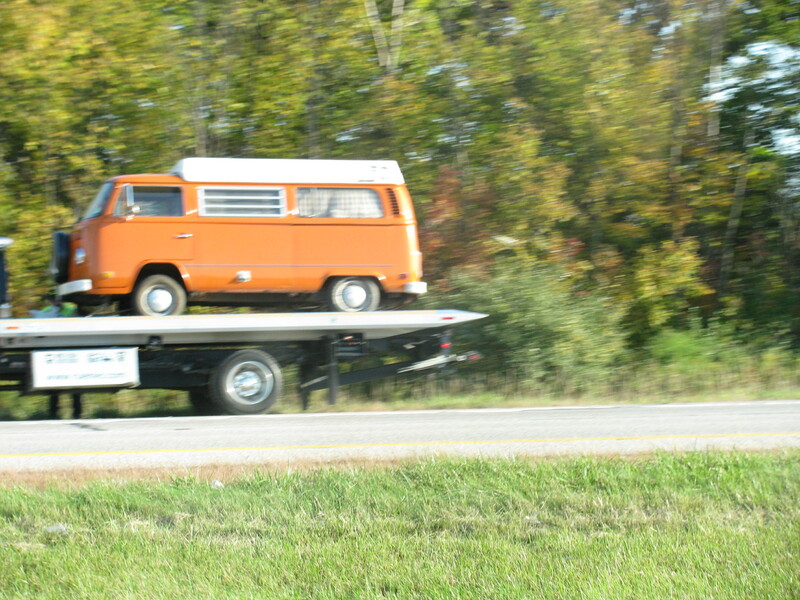 “It WILL be a missed opportunity – that bus will be towed by now,” he said. But I would not be swayed. 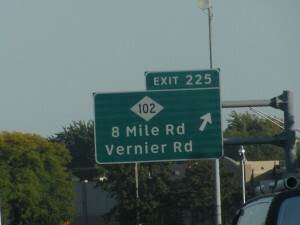 I had to drive a few more miles to the next exit, and finally got turned around. Then several minutes later we finally made it back to where the bus was, and I was about to pull over…but now it looked funny. 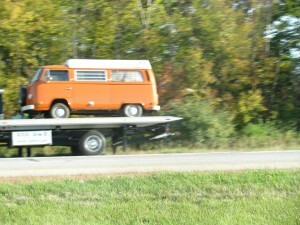 It was on the back of a flatbed getting ready to be towed! I wasn’t about to pull over on the busy Detroit freeway to spark up a conversation with the tow truck driver about what I was doing. And I didn’t have the camera out for a shot. So I had to go to the nearest exit AGAIN to turn around and try to get ONE SHOT with the camera. My dad said, “You’ll never make it. It will be gone by the time we get back.” And, it almost was. So now I’m going 70 mph in the left lane trying to zoom the camera while driving to get the perfect shot. My dad offered to take the photo. This is an example of my father’s photography. My grandfather was apparently quite a good photographer, and was in camera clubs. I’m guessing my father was not. 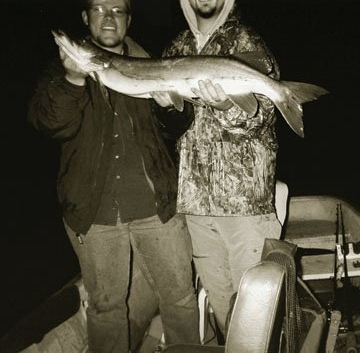 This is the first muskie I ever caught (and the only photo of it) – I am on the right. My brother-in-law nearly died laughing when I first showed him this picture. I wasn’t as happy. Luckily, I have mad Photoshop skills, and managed to fix it. No regrets this time. Missed opportunity averted.